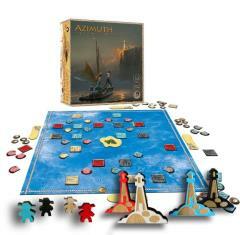 Azimuth is a game of shrewd tactics. You are survivors stranded on a deserted island, or floating at sea – and all you want is to get safely back home, sit by the fire and tell an amazing story of survival. By cleverly sailing your rafts, making the most out of local winds and breezed while always aiming to your lighthouse (your ray of hope_, it is up to your either be saved or become food for sharks.